I don’t really say Drago. But I’d love it if just one person would say Rocky Balboa. Here’s the point. So far, the names I’ve heard are more or less who you would expect. LeBron. Kobe. Michael Phelps. I’ll keep you updated. One guy, wearing a Giants ski cap, actually said: Eli Manning. I love that. In all, I’ve probably asked 11 or 12 people so far, so it’s hardly worth mentioning. But there is one semi-interesting thing. Nobody yet has named Tiger Woods. Now, this is only SEMI-interesting because, as you probably know, golf is all but nonexistent in Russia. For years there was only one 18-hole golf course in the entire country; even now there are fewer than a half dozen. Almost nobody plays golf. And professional golf is simply a non-starter here. There is not a single Russian man ranked in the world’s top 1,500 — which is the entire ranking. I don’t think there is any television access to the golf majors. So, logically, there’s no reason at all that anyone here should know Tiger Woods or care. Still … I do keep waiting for someone to mention him. I have long believed that Tiger Woods — like Babe Ruth and Muhammad Ali and Michael Jordan and Pele before him — was bigger than his sport. At his peak he transcended golf, transcended America, had become something iconic and symbolic and titanic. He still might be that. And then, well, he might not. You might think this is all just an excuse to write about Tiger Woods’ slow start — and you would not be entirely wrong. Woods, you might know, has played in two tournaments so far in 2014, both at places he has dominated. He started the year at the Famers Insurance Open at Torrey Pines in San Diego. He has won the tournament seven times (four in a row from 2005 to 2008) and Torrey is the site of his greatest victory, the 2008 U.S. Open he won on one leg over Rocco Mediate in a playoff. This time he shot an mesmerizing 79 on the third day and missed the cut. It was kind of mind-blowing. There have been a million analyses already of Woods’ rough start — and his decision to take a little time off to rest and work on his game — which might mean something and, just as easily, might not. It’s just two tournaments. It is a month or two before the golf season really even gets going. The temptation with Woods is always to put too much emphasis on the moment — to shout, “He’s back!” when he wins something, to lament “He’s finished” when he does not. If he wins his next tournament in Florida, he will become the odds-on favorite at the Masters all over again. Still, the sluggish start is a reminder that Tiger Woods — even if he plays great golf like he did often last year — is not Tiger Woods. He’s still the biggest golfer, often the best, certainly the most interesting and the one who can move the needle. But he’s a golfer. The Tiger Woods who stretched our imagination, who broke through the constraints of his own sport, who represented not just golf brilliance but ALL brilliance — that guy is gone. Well, he’s not gone. He’s 38, tired, working with another swing coach, his body has been stitched up several times and you sometimes wonder why he even bothers to play at Farmers Insurance Opens. A few years ago, even before the tabloid scandal, a prominent golfer told me that he did not think Tiger Woods would be a great old golfer like Jack Nicklaus or Ben Hogan had been. When i asked why, he said: “Because great success breeds great boredom.” His point was that the laser focus and the desperate hunger that fueled Tiger Woods to play golf at a previously unachieved level … that stuff grows old just like the body. He doubted Woods would stay that interested into his 40s. Tiger Woods is rich. He’s endured turbulent fame. He played his sport better than anyone who ever lived. Does he have that reason? That motivation? My guess is that, like most of us, some days he will, some days he won’t. Nobody stays forever young. Even Bob Dylan is doing car commercials. Wasn’t it John McEnroe that made him quit? I can’t tell if you’re being funny, genuine, or passive-aggressively mean when you drop in an “as you probably already know” right before something that of course I wasn’t even close to knowing. I also had no idea that golf was non-existent in Russia. But I also use “as you probably already know” all the time at work. It’s because a handful of people will react angrily to the perceived insult that you just laid on them. To you, maybe, but not to 100% of the world. Agreed! I mean, we’re not talking archers or billiards players here. Golf is a “game”, not a sport. Meaning no disrespect to golfers, but “athlete” is used a lot more narrowly in anglophone Europeans than Americans. Ask me to nomad a US athlete and I’d say “Carmelita Jeter”, “Galen Rupp” or “Aries Merritt”. Ask me to name a US sportsperson, and I’d be saying Lebron, Tiger, Kobe, Brady or those other guys who only need one name. Love me some Aries Merritt though. A friend of mine pointed out something interesting to me recently: The PGA banned drugs like Adderall and Ritalin on July 1, 2008. Tiger’s last major win was in June of 2008. Might the lazer-sharp focus that helped Tiger achieve greatness have been at least partially aided by drugs? I don’t really follow golf and would be interested in hearing what more informed golf fans think of this. Lifelong golfer and have played competitively at many levels since childhood. TIger and PEDs and majors would make sense if he hadn’t won 14 other PGA Tour events plus another Euro PGA event since then (including 3 WGC and a Players Championship, both of which are just a step below the majors in importance). He’s #1 in the world and right now it’s not particularly close to #2 (although the gap behind him is not like it was in his heyday). Tiger may have been using PEDs, but I wouldn’t use lack of majors as proof. Considering all the things that could affect a golfer’s performance, such as aging, injury, catastrophic personal problems (which would at least affect focus), increased difficulty of courses, different equipment, different competition, swing changes, etc., and considering that there is no evidence that Tiger Woods ever used adderall/ritalin, or that these drugs help golfers in any way, then I’d say the argument your friend brought forth is specious. First Russian athlete I think of? Sabonis – who is not even Russian. Sabonis was the first one I thought of also, but my problem did not stop there. Wait, who was that awesome Olympic weightlifter that was in the opening credits of ABC’s Wide World of Sports? …. Vasily Alekseyev. Yay, I thought of one! Check and mate to Mike Schilling! For me, the names that first popped into my head were those of the legendary pairs figure skating duo, Irina Rodnina and Alexander Zaitsev. And something else I’ve noticed (or at least think I notice)…. Is it just me, or has the mainstream sports media stopped paying attention to athletes from other countries in the non-major sports? Up until the mid 80s or so, you could find major international competitions being shown on network TV, with decent amounts of attention being given to non-US athletes. What happened? Joe, you often use the phrase, “as you probably know” for things that I didn’t already know. I’m a pretty smart guy, but I didn’t not know that golf is not popular in Russia. I don’t know what’s not popular in lots of places. Russian athlete… hum… Boris Spassky or Nikolai Volkoff. Olga Korbut and Valeriy Borzov. (God, I’m getting old). The USSR was not a synonym for Russia. My first thought was the terrifying Soviet goalie Tretiak, though I suppose he might not be Russian. My second was the Greco-Roman wrestler that Rulon Gardner beat, but I had to look up his name, Aleksandr Karelin. Yeah, I’m an Olympics guy. Lev Yashin. You gringos don’t like football, so AS YOU ALREADY DON’T KNOW, he is considered the best Goalkeeper in the history of football. (Yes, It’s called football not the other crappy word you use to call football. NOBODY in the rest of the world uses that word. NFL is played with hands not with feet, it should be called handball). The term Soccer comes from shortening association football, to so called to distinguish it from rugby football. The name was given to it by its British inventors, who began referring to it as just football again after they stopped referring to rugby football, which they now just call rugby. So Soccer is absolutely an appropriate term. Additionally, a game of American football almost always sees more points scored by kicking than does a game of soccer. Some don’t call it soccer OR football. 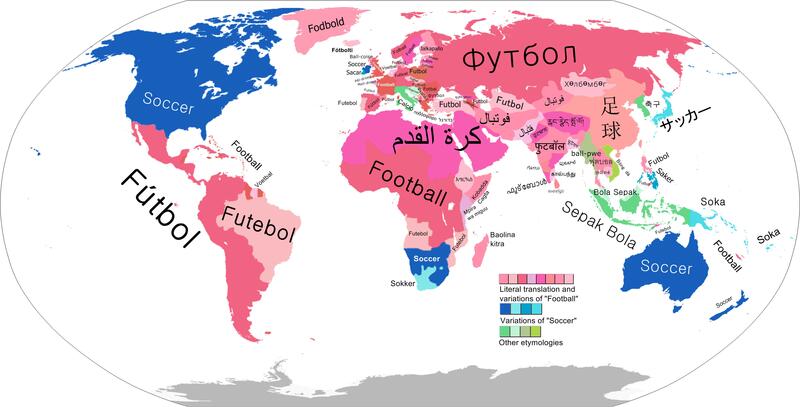 Also – Australians absolutely say “soccer”, as do many a Welsh & Irish people. In all cases, it’s because they have other codes of “football”, which are both more popular, and less tedious.